As my life changes, so will the content on my blog. 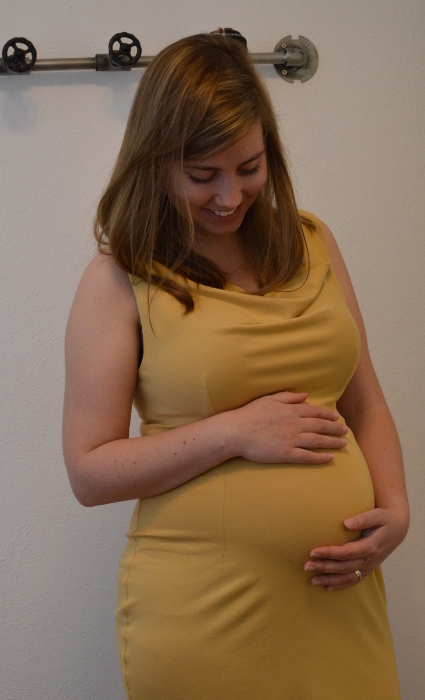 In my last blog post I told you that I’m about to become a mother so maybe it doesn’t come as a big surprise that from now on, you’ll see a bit of baby stuff here as well :). The first thing I decided to make for the baby was a changing pad that would fit the changing table we got from IKEA. Stoff & Stil also had a pattern for the changing pad but since the shape of the thing was so simple, I didn’t really see the point in spending money on something I could make myself in 30min. To begin with, I measured the sides and made a pattern for that. After the sides were finished, I measured the circumference of the pattern and the length of the foam base. With those measurements I had a rectangle that would go around the pad. Last but not least, a 1cm seam allowance was added. When the pattern was done it was time to start pattern matching and cutting out the pieces. Because of the very symmetrical geometrical shapes on the oil cloth, this turned out to be a walk in the park! To make the sewing a bit easier, I used a pencil to draw where the seam should go on both side pieces. Assembling the whole thing was a bit trickier than usual because you obviously can’t use pins on a plastic oil cloth. That would just leave ugly puncture marks all over the place. Instead, I got to use these handy little clips from Clover that I got from Okadaya in Tokyo. The first step was to attach the invisible zipper. I can highly recommend inserting the zipper as soon as possible. It’s just so much easier to attach it to a garment/cushion/etc. when the fabric lies flat. Next, I continued sewing around the side where the zipper was attached. One stretch at a time was “clipped” together and sewn. When reaching the corners, I had to cut the oil cloth in order to continue with the next stretch without the fabric bulging into weird shapes. The same procedure was repeated for the other side and last but not least, the side seam on the large rectangle was sewn. Half of the zipper is in place. “Clip” and sew one stretch at a time (red clips). The pink clip to the right just keeps the oil cloth in place. Yay, the first cover was done! At this point I had no idea that I would spend the coming 15min sweating and cursing while I was wrestling the foam base into the cover. Have you ever touched and eel and gotten surprised at just how slippery it is? Well, that pretty much describes my experience with the foam, only that the foam was the exact opposite of slippery. After I won the wrestling match, I decided that I wouldn’t be making a second cover. There is just no way I’m putting a cover on/off of that changing pad on a regular basis. Instead, I’ll probably make something like a towel/blanket to put on top of the changing pad. That way it would still be nice and cosy for the baby and easy to remove and throw in the laundry. The finished changing pad on top of the changing table! Categories: Baby, Misc | Tags: sewing | Permalink. 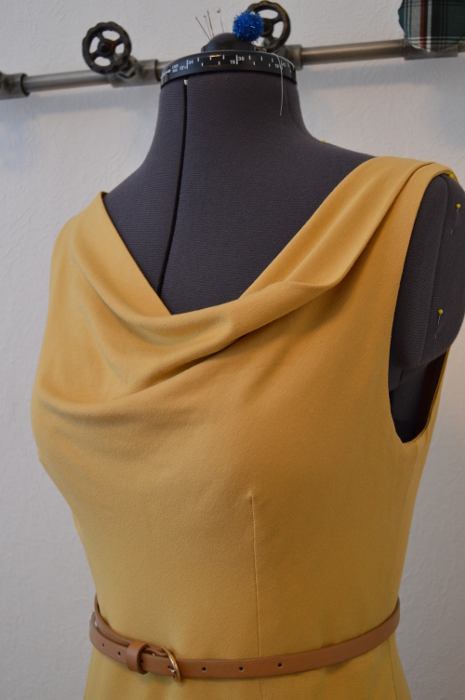 This third version of the “asymmetrical neckline dress”, was a little something I started working on right before Easter (hence the colour). I wanted a nice and comfortable dress that I could wear at home so I decided to make it in this wonderful yellow jersey that I bumped into at the fabric store. I was also interested in seeing how the jersey would drape compared to the other fabrics. Even though it’s the same pattern, it looks quite different from both the tartan and the graphite dress. The other two fabrics had a bit more structure compared to this one, which basically lives a life of its own. Categories: Dresses | Tags: Asymmetrical Neckline Dress, dress, sewing | Permalink. The main fabric for the dress is a medium heavy cotton fabric with a tartan print. Its properties are similar to my usual muslin fabric from IKEA, only a bit thicker. For the lining of the skirt, I used a regular lining fabric (probably polyester). The graphite version of this dress didn’t have a lined skirt and the only reason for that was that the inside of that fabric is very sleek as it is. The cotton however, needed lining, otherwise I would’ve ended up with a skirt moving higher and higher up my thighs. Inside of the tartan dress (front). An improvement from the graphite version of the dress are the belt loops. Since the tartan pattern changed between the skirt and the top, it would look much better with a belt. And to keep a belt in place, you need belt loops :) Another detail worth mentioning is the “chain sewed” thread that attaches the under skirt (lining) to the outer skirt. This keeps the under skirt from sliding around. I’ve also included a neat way of sewing darts and fastening the thread. Just start sewing your dart and when you’re close to the edge, carefully sew a couple of stitches parallel to the edge. After the parallel stitches, steer the needle over the edge and sew ~1-1.5cm without any fabric. Stop sewing, lift the presser foot and move the fabric towards you. Now sew a couple of stitches on the dart to fasten the thread. It’s quick and easy and the result looks great every time. Close-up on one of the two belt loops. This little thread prevents the under skirt from moving around. Quick and easy way to sew a dart and fasten the thread. The inside of the invisible zipper. Have you ever found yourself being blind to flaws? Everything is fine as long as you’re blissfully unaware of the situation but when you suddenly start to see the problem, it just wont go away. It’s a bit like the Matrix, once you’ve seen the lie it becomes impossible to ignore. My ‘Matrix’ was the sewing room (or rather sewing corner because the same room also works as an office). I knew already beforehand that the room was a bit untidy and that I had collected quite a number of things that was bursting out of the tiny wardrobe. But I didn’t see just how awful it was until we returned from Japan after four weeks of vacation. Like the proper Swedes we are, my husband and I went to IKEA to get a new and bigger wardrobe. We got two 50cm PAX wardrobes with two BERGSBO doors. The possibly best feature with the PAX wardrobe is the pull-out-tray KOMPLEMENT that I’ve put one of my sewing machines on. Whenever I need it, I just pull out the tray and grab the machine. Wave goodbye to the risk a strained back! Another feature I’m very fond of is the box combination HYFS that fits perfectly inside the drawers. Inside the boxes, I’ve organized ribbons, elastics, pins and needles, scissors, you name it! It no longer matters if things slide around inside the drawers because they will be separated by the boxes. Behold my sewing corner after the reorganization! In the space between the wall and the wardrobe, I store everything that’s too big to fit inside the wardrobe. For example, a cutting mat, pattern paper, large rulers and my cheap muslin fabric (also IKEA). The observant reader might’ve already noticed that my Pfaff Hobbylock is gone and instead there’s a Janome MyLock 644D. The Pfaff was alright but it broke down right in the middle of my Asymmetrical Neckline Dress project and I had to buy a new one. I guess all machines have their quirks and you learn to deal with them as time goes on. So far, I find the Janome easier to deal with (especially when it comes to thread tension) and I’m really glad I bought it. Categories: Sewing Machines, Uncategorized | Tags: sewing, sewing room | Permalink.